Over on my personal blog, I wrote a quick post talking about why I was so excited for the Guardians of the Galaxy movie. As much I was a major fan of the comics, I also recognized that the Guardians were never really "A-list" material among Marvel properties. Let's face it - the team really consisted of a lot of older Marvel intellectual properties that had been lying around until Dan Abnett and Andy Lanning managed to reinvigorate the "cosmic" side of the Marvel Universe starting with the Annihilation story and the subsequent titles that tied into that first event. So the news of a Guardians movie caught me totally by surprised. And like any other good comic book fan, I was initially prepared to hate this movie since I figured that this was a cheap shot by Marvel to create a more science fiction style story in contrast the other movies in the Marvel Cinematic Universe. But with each new trailer and character featurette released to the public, I have to admit I started to feel a real sense of hope for the movie. More and more the clips were demonstrating that they actually had a good handle on the characters that I loved and they had placed them in a movie setting that just might do them justice. And by the week of the movie's debut, I was practically rapid to see it on the big screen. Heck, I was willing to even watch it in 3D. So is the movie worth it? Did the movie meet even my elevated comic book fan expectations? Oh das't yes. Heck, it was even better than I expected. 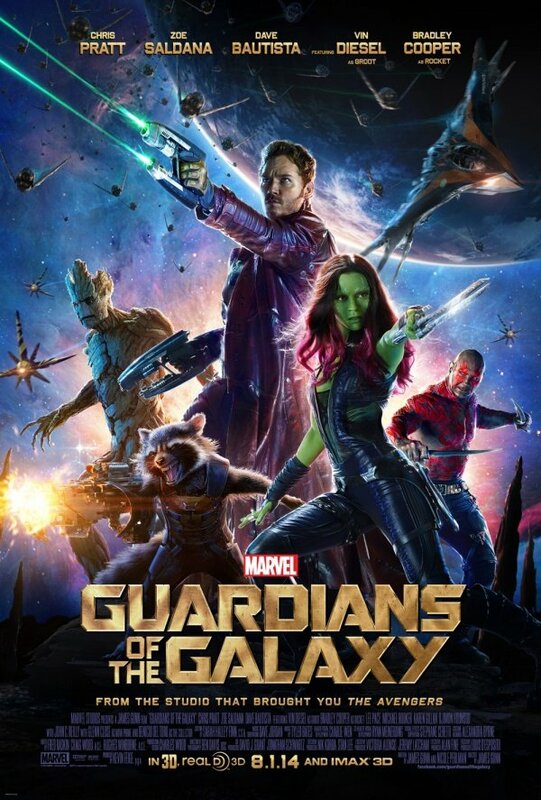 Synopsis: Guardians of the Galaxy is a 2014 science fiction superhero movie based on the 2008 version of the comic book team of the same name created by Dan Abnett and Andy Lanning. It was directed by James Gunn with a screenplay by James Gunn and Nicole Perlman. The movie begins in 1988 and a young Peter Quill is struggling with the fact his mother is dying. His main escape is a cassette that she had prepared for him - The Awesome Mix Tape Vol. 1, that he listens to constantly. Just before her death, she offers a gift for him with instructions that he only open it after she's gone. But shortly after her death, Peter is abducted by an alien vessel. 26 years later, we meet an older Peter Quill or Star-Lord (Chris Pratt), who steals some orb-shaped artifact as part of a contract deal. He barely escapes from Korath (Djimon Hounsou) and his forces, who had also come for the orb. Quill then takes the orb to Nova Corps homeworld of Xandar in order to sell the orb directly to the Broker, thus cutting out Yondu (Michael Rooker) and the other Ravagers, the band of pirates that had kidnapped Peter all those years ago. Yondu puts out a bounty on Peter, and this attracts the attention of the unusual pair of Rocket (Bradley Cooper) and Groot (Vin Diesel). At the same time, Korath's loss of the Orb causes his master, Ronan (Lee Pace) to dispatch the assassin Gamora (Zoe Saldana) to retrieve it at all costs. All of them converge on Xandar at the same time and end up getting arrested and sent to the Kyln, a remote prison for criminals apprehended by the Nova Corps. Inside they eventually meet Drax the Destroyer (Dave Bautista), who has sworn to kill Ronan one day to avenge the death of his family. The group eventually find common ground in being on the wrong side of Ronan's interests and they somehow band together - or at least travel together in the same direction. As stressed in the many trailers, there is no logical reason why this "team" of misfits should work as a group. Each has different agendas and priorities and only tangentially related goals that are somewhat in the same direction. The character types are wildly different given the mix of killers and a talking raccoon-like creature thrown into the mix. But one thing leads to another and things just start clicking into place and the characters stop being individuals thrown together by chance and become an actual team, bonded to one another through some pretty crazy trials and fights that somehow leads to actual friendships. And this strange diversity goes beyond the fictional characters - I can't imagine what it was like pitching the idea to any executive that the cast for this movie would end up with 2 CGI characters, a wrestler, a TV sitcom character actor and a woman who seems to have a thing for science fiction action movies. And this is where Gunn's brilliance as a director came in and managed to create a genuine sense of camaraderie and friendship among our rather colorful guardians. And it's not like things are all that bad on the other side of the fence. It's hard to dismiss Yondu as some two-bit villain right off the bat. Rooker does a pretty good job of portraying this rather gruff mentor figure who constantly threatens Quill but was also largely responsible for raising him. Lee Pace's Ronan was as over-the-top as was required for the script, although I'll agree they went a little overboard with the black make-up on his face and in his mouth. But the character that really shined was Nebula, as brilliantly portrayed by Karen Gillan. Without giving too much away, the movie version of Nebula is far more menacing than the comic book version ever was. And we're all the better for it. All roads leads back to James Gunn in terms of why this movie worked, and I have to admit that I had no idea who this guy was prior to this movie. His body of work doesn't exactly say a whole lot about his ability to handle a movie like this considering his sort of counterpart is Joss Whedon helming the Avengers movies. But Guardians is a lot more than just the Avengers in space. And Gunn really managed to create a distinct universe for these characters to operate in that was magical, wondrous, and yet also familiar. Sure he plays on a lot of science fiction movie tropes and you'll see the familiar patterns established by other superhero movies. A good example of some of the great elements in this movie is how the different Guardians deal with obstacles in their way. From the very first time they encounter one another, the drastic differences in their way of handling things is pretty clear. Peter Quill has decent fighting skills, but he's better at talking his way out of trouble or thinking of brilliant / ridiculous ways to get out of the current situation. Gamora is naturally the all-around fighter whose martial arts prowess is practically like dancing at times. Rocket is the gadgeteer and he's quick to develop a technological gimmick to get out of things or at least a bigger gun that will deal as much damage as he can. Groot is indeed the muscle, but there are nuaces to his tree-based abilities that are only best conveyed visually. And then you have Drax whose single-mindedness (and in the movie his literal-nature) help keep him focused on the next battle where he will use a combination of brute strength and prowess to barrel his way through things. And all this is depicted wonderfully throughout the movie. The twist here is how Gunn also managed to give the movie some real heart - a pulse that resonates throughout the entire movie that helps us mere humans deal with the over-the-top space visuals and galaxy-spanning threats. And this most noticeably established by the music, which is more than just a quirky plot device. The Awesome Mix Vol. 1 is literally the soundtrack for the movie, but it's also Quill's last true connection to Earth and ultimately his mother. It also acts as an interesting counterpoint that helps the viewer still feel like they're a part of the movie experience despite the fact that they're staring at a mining community called Knowhere built inside the giant severed head of an ancient Celestial. It's an interesting human element that really just pulls at the heartstrings of the audience and wonderfully frames the big space adventure. As a comic book fan, there's a lot for me to complain about - but this is never the point of such movies. For every bit that they'll get "right" in terms of comic book lore, there will always be an equal number of things that they'll get "wrong". But movie versions of all comic book stories are always different in many ways, and this can be either good or bad. In this case, many of the changes made to the core Guardians mythos weren't big deals and were generally justified by how things have been going in the Marvel Cinematic Universe as a whole. Despite all the little differences, one totally has to credit James Gunn for capturing the true spirit of these characters and found a fun and highly entertaining way of present the team's unique dynamic to viewers, regardless of how well they knew the original comic. And let's face it, Guardians was a slightly obscure enough comic to slip past even most Marvel fans. Guardians of the Galaxy is fun. It all boils down to that, really. It's a highly entertaining adventure with an overall impact that is typically described as "awesome" here on the internet. If you're still reading this review, you need to get a life and go and watch this movie. And if you've already seen it and agree with what I've had to say about the movie thus far, then you know that you want to go out there and watch it again. Do it now. This movie is without a doubt a solid 5 possible interpretations for the solitary line of dialogue "I am Groot" out of 5. PS - I <3 COSMO.